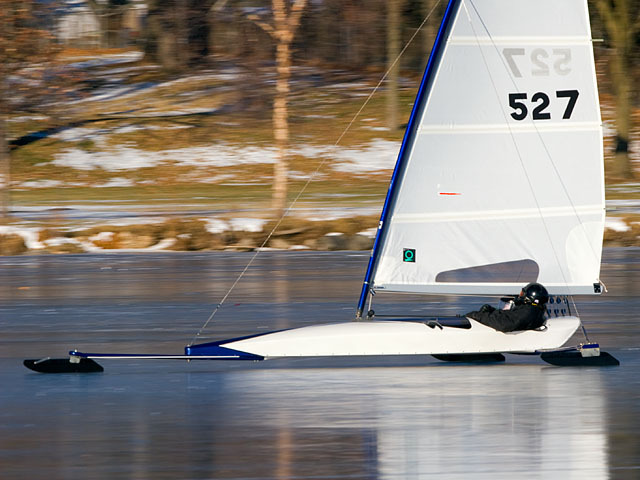 One of my hobbies is iceboating. Normally I'm sailing, so I don't get to take too many photos. Here's one from a "fun day" on the tiny Lake Wingra in downtown Madison (WI). This is a pretty standard panning shot with a medium-slow shutter-speed of 1/125 sec. One post-processing trick I used was to apply a little bit of Photoshop's "Shadow Highlight" adjustment on about the top 20% of the highlights to bring some depth into the sail and to show the curve on the top of the deck better.